It covers horror fiction from the 70’s through the 80’s, with a little glimpse of the early 90’s. 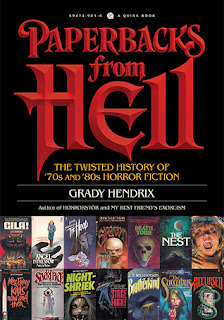 Eight easy-to-read chapters with clever titles like “Hail, Satan,” “When Animals Attack,” “Creepy Kids,” and “Real Estate Nightmares,” explore different themes within the horror genre and the cultural anxieties prevalent at the time these books were written. The writing was light, humorous, informative and imbued with a deep love for the horror genre. Back in the 70’s and early 80’s, I was still attending church regularly, so you can imagine how conflicted I felt reading books about the Devil. They were fun and addictive and I had to be resourceful about finding good hiding places for them so the evil eyes on the covers wouldn’t terrify my grandmother. I got bored with them quickly, though, and later on had more fun reading about creepy kids and nature going wild. Some of the covers in “Real Estate Nightmares” look very familiar. I’m sure those books graced my shelves at one time, yet I have no memory of reading them. Which is surprising, really, since high crime and good friends leaving for the safer suburbs was a huge concern of mine. Then Bernard Goetz expressed the rage felt by New Yorkers tired of crime by shooting four thugs who wanted to rob him. My dad and I proclaimed him a hero, while my mom and brother felt he may have overreacted. By the time the crime rate plummeted in the city, I was already gone. I appreciate the high quality of this book and plan to buy a copy to keep on the coffee table. It has a durable cover, thick pages and eye-catching, colorful images. This brought back a lot of pleasant memories for me and makes me want to seek out the titles I haven’t read and reread the ones I enjoyed.